Smart Breakfast: Winner Takes All? Cyber Security is a growing concern and priority for businesses, large and small, the world over. Cyber attacks, data breaches, privacy issues – it’s a complex and fast-evolving field that requires expert advice and support. It’s equally as important for individuals – identity theft, scams and fraudulent behaviour can wreak havoc in our daily lives. Cyber abuse is also on the rise, and a real threat for many women from a domestic violence perspective. And the prospect of being “trolled” for any woman who puts herself “out there” and has a voice on social media is extremely high and often enough to stop women sharing their opinions and expertise online. As a relatively new field of expertise, it’s ripe with opportunity from a career perspective. There aren’t many women in the sector, and less in the top jobs. We were therefore delighted to host Jacqui McNamara, Head of Cyber Security Services at Telstra, as our guest speaker at SmartWomen Connect in September 2018. Jacqui is smart (of course), straight-talking and passionate about the industry, and also about encouraging more women to enter the industry and progress in their careers. And as a trailblazer in the area she’s got a few good stories to share and wisdom to impart that’s relevant to ALL women working in corporate. Members and guests enjoyed a light lunch and networking, followed by a straight-shooting, intimate conversation and Q+A with Jacqui facilitated by our Founder, Fiona Craig. We talked about the importance of cyber security, and what you can do to keep yourself safe online. Jacqui also shared her advice for women looking to progress in any male dominated industry. We were delighted to be hosted once again by one of our key supporters, Lander & Rogers. 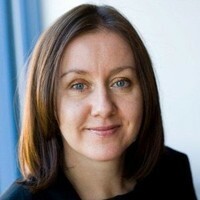 Jacqui McNamara has worked in the cyber security field for more than two decades. She is currently the Head of Cyber Security, Telstra, and has previously run startups in the security sector and managed large businesses for IBM, HP and Dimension Data. She is a passionate supporter of diversity and women in the industry and is Chairwoman of Females in IT and Telecommunications, Australia’s largest and longest running body for women in the industry. She also co-chairs Telstra’s Enterprise Gender diversity council. Jacqui speaks regularly on cyber security and risk as well as diversity and inclusion. She is a former intelligence officer with the ADF. She enjoys the opportunity to challenge assumptions and norms around the role of women and other minorities in the industry and across the board.